Big Gap Flume. Photo was taken between 1860 and 1868 on the southern end of the Big Gap Flume. Photo courtesy Tuolumne County Historical Society. An incredible engineering feat for 1859, the wooden Big Gap suspension flume towered 25 stories high and spanned almost one half mile across Conrad Gulch to bring water to the mines, rangeland, and farms of Groveland’s surrounding communities. The Golden Rock Water Company hired mostly Chinese laborers to build flumes and dig associated water ditches with picks and shovels. By the summer of 1868, the Chinese laborers had dug a network of ditches for the company, totaling over 100 miles for the company. Typically, engineers instructed laborers to dig ditches and build flumes paralleling contours on the side of slopes to allow gravity to transport water over great distances. However, transporting water across the deep and wide Conrad Gulch proved to be challenging. The Golden Rock Company ultimately decided to build a wooden suspension flume across the gulch. G.W. Holt designed the suspension flume to be supported by eleven regularly-spaced towers, which were stabilized by guy wires. 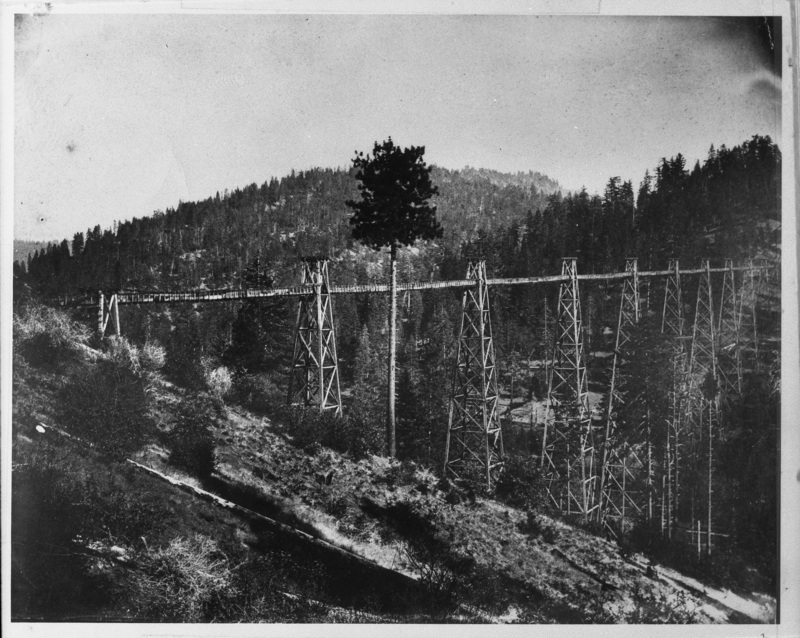 Built mainly from sugar pine, Holt predicted the flume would last 7 to 8 years. Water first began flowing through the suspension flume on March 29, 1860. Many Chinese bought the water either for placer mining or for domestic purposes for the small Chinese community in northern Big Oak Flat. However, water delivery was sometimes interrupted for several months due to dirt slides into the water ditch or damage to the suspension flume. Less than a year after the collapse of the Big Gap Flume, the Golden Rock Water Company successfully secured materials for an iron pipe to replace the flume. With the cooperative help of 2000 miners, which undoubtedly included Chinese, the miners installed the siphon pipe along the surface of the gulch in a short 2 months. Water began flowing through the pipe on July 30, 1869, and served the community for several more decades. It is unclear when the pipe was last used, but the water ditches were last used in 1923 to supply water for fire protection in Groveland and for railroad and associated buildings in the local area. 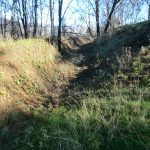 The ditches lost their importance after Hetch Hetchy was built, and Tuolumne County acquired it in 1942 after the ditch owner failed to pay property taxes. No known wood exists from the Big Gap Flume, as the wood is susceptible to rot and fires that have passed through the area since 1868. The only remnants left of the Big Gap Flume are dirt mounds where anchors were buried. Cables from the towers were attached to the anchors to prevent lateral tower sway. The iron bolted pipe measuring 22” in diameter still spans across the surface of the gulch on either side of Highway 120. Depending on your vantage point and the extent of vegetation growth, the pipe is still visible as of 2016. The pipe pathway marks the same pathway where the Big Gap Flume once stood. Deep ditches dug by the Chinese laborers still exist near the top of each of the 2 ridges where the pipe ends. The metal pipe spans the gulch crossing Highway 120 below. 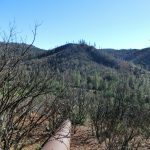 The photo was taken in 2015 on the northern ridge of the siphon pipe. The southern portion of the siphon pipe is visible on the southern ridge. Photo courtesy Fred Wong, US Forest Service. Water ditch. The photo was taken in 2015 on the southern ridge where the pipe once emptied its water. Photo courtesy Fred Wong, US Forest Service. 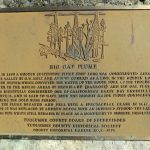 Big Gap Flume Historical Marker taken in 2015. Photo courtesy Fred Wong, US Forest Service. Access direction: From Groveland, travel east along Highway 120 for about 10.5 miles towards Buck Meadows. Near the east entrance of the Buck Meadows Restaurant and Lodge (7649 Highway 120, Groveland, CA), park at the entrance of a user-created dirt road paralleling the north side of Highway 120. Hike along the dirt right (keep right) for about 0.24 miles to the location where the siphon pipe crosses the dirt road.